"Each of us has the opportunity to live out a full and rich life. At least 70% of our illnesses are caused by the inadvertent collision of our lifestyle choices with our genes. My goal is to lead people to play the symphony given to them by their Creator in their genetic code. I want you to feel well, look well and live well by identifying, stopping, and even reversing the process and damage of aging. We strive to calm your body's inflammation, balance the core imbalances that put you at risk and restore a youthful endocrine system and a youthful countenance. "We are completely focused on a customized and personalized plan to help you achieve a long life with the best quality of life attainable." Dr. Whitcomb is uniquely placed to assist his "partners in health" in a program to looking, feeling and living longer and better by delaying, preventing and reversing the signs and symptoms of aging. 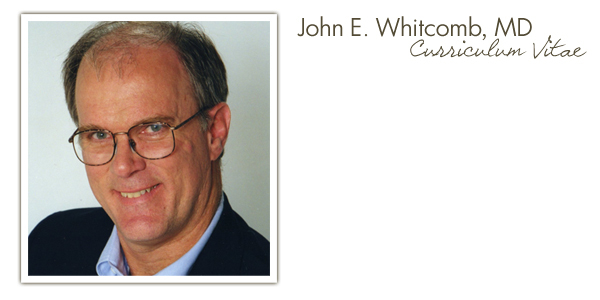 Dr. Whitcomb is a world citizen, understanding the richness of many cultures. He grew up in India of missionary parents, attending one of India's highest performing Schools, Woodstock School. From there he moved to Johns Hopkins University for undergraduate study. He participated in starting the first longitudinal primary clinic in American medical schools at Yale University School of Medicine where he was awarded the Patient Advocacy award for that innovation. His life in Emergency Medicine has also been that of many leadership positions in both his health care systems where he has been the director of many different hospitals' ERs and led his professional society and many regional and local committees in looking at the world in new and innovative ways. It's not surprising that he is now at the vanguard of leading the way with new ways to keep you well. "This is the future of medicine. It's the natural path, to keep exploring down to the cell, to the membrane, to the molecule to understand how to play out your symphony. Rather than wait for disease and try and fix a broken body, I'm interested in fine-tuning your physiology, and watching with wonder the beauty of creation as you heal naturally and abundantly." Dr. Whitcomb is Board Certified with the American Academy of Anti-Aging Medicine in which he is fellowship graduate. He has completed the only Masters Program of Metabolic and Functional Medicine in America held at the University of South Florida - the only physician in Wisconsin to have done so. And recently, he has started another master's program in Integrative Cancer Care, another first and only in America. He is Board Certified in Holistic and Integrative Medicine from the prestigious Scripts Institute and a diplomat of that college. He is board certified in Internal Medicine, Emergency Medicine and Disaster Medicine too, but those aren't what we are talking about here. Those are just icing on an experienced resume. Dr. Whitcomb is not just a physician but an advocate for peace and justice around the world. He remains invested in giving and supporting the hospitals in India his Grandfather founded and his father helped sustain. Khariar Hospital, Tilda and Mungeli, all in SE India that serve some of the poorest of the poor. And some of the proceeds of this clinic will always be channeled to those missions and ministries. "That's how we live our lives. We give back for the privilege of being so blessed by chance and opportunity." Dr. Whitcomb is married to Rev Holly Whitcomb (just about 40 years). Holly leads retreats (www.KettlewoodRetreats.com) and sees clients in private practice of Spiritual Direction. John and Holly conduct retreats together that often sell out called "Conscious Aging" at Cedar Valley Retreat Center. They have two grown children, David, and Kate who are living their own interesting lives. Hobbies? Dr. Whitcomb is a gardener and takes pride in his yard. He hikes with the Wisconsin Go-Hiking Club and plays bridge. Solace and communion with dirt is where he goes to find his third space. Touching the earth... earthing. comes naturally to him. Come over some time... He'll show you his oaks and his hostae.